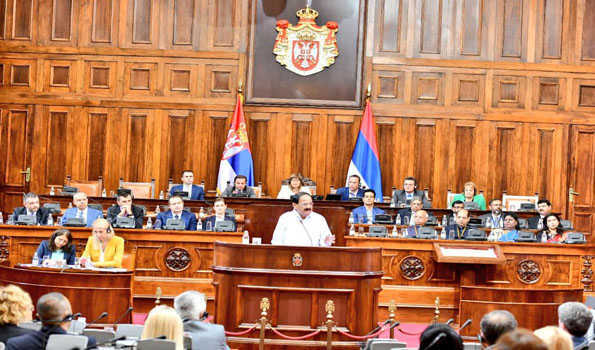 The Serbian parliament started its new special session, but without most of the opposition MPs. The MPs from the Alliance for Serbia (SZS), the largest opposition coalition, as well as some other lawmakers have decided to boycott the sessions of the legislative branch. The boycott is conducted by the MP’s of the Democratic Party (DS), the conservative group “Dveri”, the Social-democratic Party (SDS) and the Popular Party (NS), which are all members of SZS. The club of Independent MPs, which does not stand with SZS, but it has signed the Agreement with the People, also boycotts the parliamentary procedures and demands “fair and free elections”. The boycott is an obligation towards the citizens whο take part in the protest throughout Serbia, and is also stipulated in the Agreement with the People, opposition MP’s say. Bosko Obradovic, leader of Dveri, said on Monday that “starting from today there are two parliaments – the usurper one, and the democratic one which would hold its sessions in the lobby (of the parliament)”. The SZS members of parliament demanded the resignation of education minister Mladen Sarcevic who has recently downgraded the importance of academics from universities and other scientific institutions who gave their support to the protests. However, as Popular Party (NS) vice president Miroslav Aleksic said, they also demand the resignation of “everyone in the executive power”, as well as parliament speaker Maja Gojkovic, “because they have breached the laws and the Constitution”. “We are faced with the collapse of the system in Serbia. There is no one single institution that functions properly; all institutions are hijacked by one person”, Aleksic said, alluding to Serbian president Aleksandar Vucic who is also leader of the Serbian Progressive Party (SNS).